You are currently browsing articles tagged Katie Botkin. 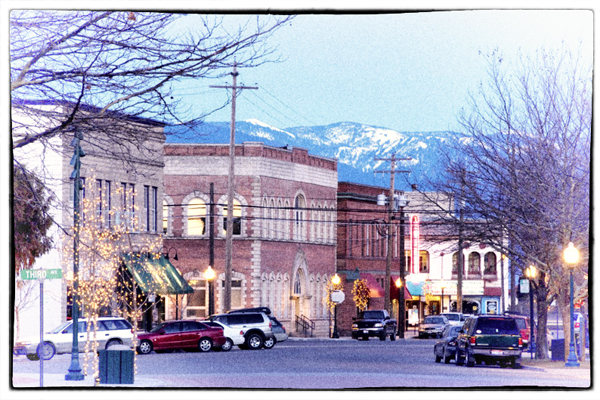 Sandpoint, Idaho–just like Amsterdam minus the Red Light District. Photo courtesy of Big Leap Creative Photos. I have to say, I haven’t always had the best of luck finding a roommate in North Idaho. Most nice professional single women here tend to want their own place, because they move from someplace like New York and the rent is so much cheaper. There was one guy a couple of years ago who moved in and then the job he moved for fell through. He moved out promptly. There was one girl who liked to stay up cooking very late, and then accidentally left a pizza burning in the oven all night. She moved out less promptly. Then there was the girl with the super-hippie boyfriend. This last time, I wrote up a detailed description on Craigslist, describing myself as a light sleeper who disliked drugs and wanted the house kept clean. I got a response more quickly than I’d anticipated. Another guy, but he described himself as employed, quiet and not into drugs either. We exchanged a couple of e-mails. He was fairly articulate and seemed nice enough. So we met up. At the meeting, I asked him for his references. He wrote down a few names for me. Before I called them, I tried looking him up on the internet. He had a common name, but now I knew what he looked like. Within one minute, I had found an article from a semi-local newspaper with his photo. As it turned out, he had been arrested for getting in a race-related brawl, and someone had tried to prosecute him for passing out white supremacist literature, which of course they couldn’t legally do. For a few seconds, I wondered if my usually-inclusive nature should include even white supremacists. And then I decided that because of the color schemes of my friends, that might be a risky decision. I e-mailed the guy and made up some excuse, not knowing what else to do. This one has turned out to be (after more background checks) actually quite an excellent roommate. He works until 11 and then comes home and goes to bed. He washes his one dish every morning. I mean, it’s been all of two weeks, but in that time he has also told me some of the funniest childhood stories I’ve ever heard, in the half-hour between his coming home and going to bed. Last night, he was relating how when he was a kid, they used to shut down the school by breaking a thermometer and tainting the grounds with mercury. Then there would be radiation alerts, and they’d all get sent home. Or else they’d put rotten eggs behind the furnace. He likes Sandpoint. He says it’s like Amsterdam, minus the Red Light District. 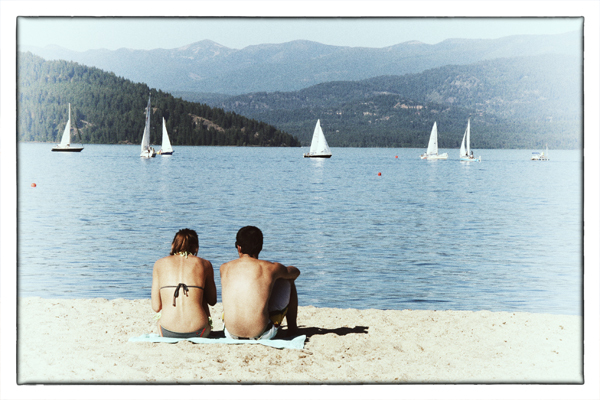 Summer on the lake in Sandpoint, the best little town in Idaho. Photo by Katie Botkin. On Thursday nights, there’s this phenomenon called dollar beers at Eichardt’s, the local pub and one of my favorite pubs ever. They tap a keg, and everybody gets whatever microbrew it happens to be. Several pints, usually. I often try to limit myself to one, but that doesn’t always happen. Once you’ve been going there for awhile, you can walk in by yourself and find at least one other person you don’t mind talking to for a couple of hours. It’s like church. Actually, some people even call it church. People tend to be very generous when a pitcher costs $4 and they know half the bar. “Put it on my tab,” they’ll say grandly. A couple of Thursday nights ago, I ran into a team of bicyclers who had stopped in Sandpoint for a rest day. They were biking from the East Coast to the West Coast in support of Multiple Sclerosis. Or its demise, I suppose. The next thing I knew, it was 3 am, and I’d moved on to Jameson and listening to them describe how the trip had restored their faith in humanity. I kept in touch, tracking their progress to Seattle. I never expected to see them again, but lo and behold, after one day in the city, some of them returned to Sandpoint, driving through the night. This may have had something to do with the fact that they knew a guy who owned a brewing company in Sandpoint, but I like to think that it was because they were telling the truth when they said Sandpoint was the best town they had discovered in their two months of touring, and they wanted another adventure before they had to return to their real lives in Philadelphia. 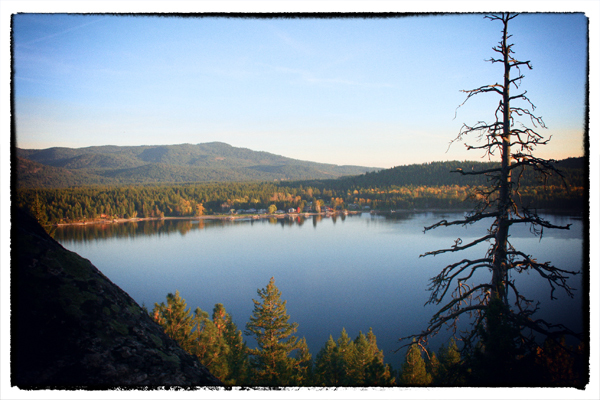 Perhaps the scariest residents of Northern Idaho are not the cougars, the bears, or the wolves, but some of the people. Many of them live off the grid, up in the hills, where the government won’t be able to find them. I see a few in town from time to time. Even these off-the-grid people seem harmless to me — at least the ones I know. They might sympathize with Randy Weaver, but mostly, they just want to be left alone. They can be a bit extreme about it, of course, so you do not want to trespass. Which leads me to my favorite story about a North Idaho woman. I didn’t catch her real name, but my friends affectionately christened her Mrs. Rambo. We had intended to go for a hike on one of the region’s many trails, and rode in a pickup up the pock-marked gravel road to the trailhead. We noticed two things: first, that the trail was blockaded due to grizzly bear sightings. Second, that the trailhead also contained a tent, constructed next to a pickup with faux cowhide seat covers. We pulled out the map and started looking for another trail nearby. Mr. Rambo had come up from the creek by this time as well and was standing back apologetically. Mrs. Rambo came over to our vehicle, sans weapon, and tried to nudge us back in. For some reason I was not actually frightened by this situation. Worried, yes, but Mrs. Rambo was so rotund, and so clearly drunk, and her fake cowhide seat covers were so tasteless, that it was hard to take her seriously. My friends were chuckling, which enraged her further. “Go!” she cried, waving her hands in the air. My friends made a show of folding their map up and we left. 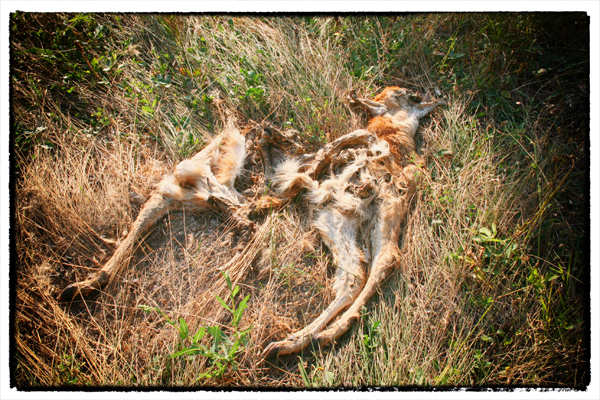 The dead fawn. Photo by Katie Botkin. As I lay out there in the yard, now relatively alone, I started wondering if the cougar was nearby. A couple of weeks ago, my 18-year-old brother was out for a walk with a girl. They had meandered down to the pond and started up a hill when Isaiah spotted a dead fawn. And then another. And then a doe. And then, out of the corner of his eye amidst this carnage, Isaiah saw the cougar. The girl let out a scream, turned, and ran. Note: this is not what you are supposed to do when you spot a lethal cat. Isaiah knew this, but he wasn’t going to let this girl go running away alone, like in some bad horror movie. So he ran after her. She fell down. He pulled her up and they kept going. They made it to the house and the cougar had not eaten them. Cougars are not a rarity out there on the edge of the world. For a couple of summers when I was home from college, I used to go over to a neighbor’s, an older woman who had spent time in France, for pastries and French conversation. I took a shortcut through the woods. My dad made me carry a large handgun, just in case. I thought at the time that it was an ironic situation. Tea in delicate cups and a handgun for the cougars and the bears. Because of course there were bears, too. You didn’t see them so much, just the remnants they left in the apple orchard. Her parents bit their lips to keep from laughing at her. “No, that’s not for eating,” they said. We walked back up to the house and ate chicken grilled over apple and mesquite wood instead. Katie in her grandmother’s taffeta ball gown. Photo by Matt Stauss. My grandmother, who is ten years older, did all the glamorous stuff — worked in New York in the fashion industry, went to Europe, decided she wanted to live there, had exciting boyfriends who painted her picture and bought her silk that she made into ball gowns. One of these gowns fits me, very snugly. Or it did a couple of years ago, when I was almost emaciated. The waist is all of 22 inches. Aunt Nancy wonders aloud how anybody could be that skinny. And I’ve never thought about it before, but I’m glad that not everyone in the world wants to run away to Paris and be glamorous. I mean, I do, but if everyone did, I would never have experienced the farm, had these memories, come back from Europe to this.